Clock discs are now a necessity according to the road traffic act. Not just that but these items have to be placed in such as that they can be easily read from the outside of the car too! Which means the level of visibility is broadened instantaneously; a fact that has not been missed by our marketing experts at allbranded! This law is in fact perfect for your company and your advertising message and a missed opportunity if not made use of! Print promotional clock discs of allbranded with your logo and distribute them among car drivers and by doing this, you'll let customers do the promotion for you. Why not check out our varieties of branded keyrings, pens, pencils, clocks, mugs, umbrellas, eco-friendly bags, usb-sticks, folders, holders and other promotional car accessories for more options? Surely there have been times when you bought parking ticket and displayed them clearly on your dashboard. Somehow these always find a way to topple which opens the path to all sorts of issues not to mention fines and time limits as well as countering claims. All these issues can easily be avoided by purchasing these promotional products and making sure you are well positioned at all times and these accidents are never likely to inconvenience you ever again! As promotional products, these do not only have benefits for your customers and save them from fines, but they are also good advertising products that reach a lot of people. Customers who use these with your company logo directly advertise for you at every parking bay. Disc parking was first introduced in Paris in 1957 and adopted in Germany in 1961; in both cases the new parking system was introduced in an attempt to move away long-term parkers without making use of parking meters, which were considered too expensive. The concept proved to be effective and it spread throughout European countries in the 1960s. The first parking discs showed two faces; one with the arrival time and one with the departure time. Over time different variations of parking discs were created, including the Swiss variant that allowed for a fifteen-hour maximum parking time. On March 31, 1979, the conference of ministers of transportation in the European Union decided that a European standard should only use designs with a single face. The standardised version was introduced as federal law in Germany in November 1981. From 1998, the old designs began to be abolished. 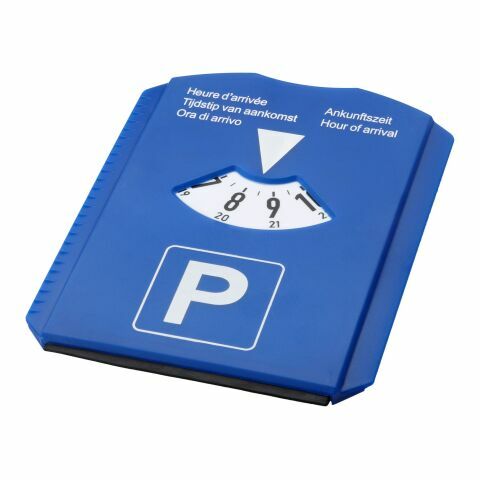 France set the last date to 2007, while in Switzerland (not an EU member) the EU parking disc design was introduced in 2000 and the old designs abolished in 2003. Modern parking signs demanding disc parking include a pictogram of the standardised EU parking disc along with a number showing the maximum parking time in hours. Suitable for gift bags combo with promotional pens etc. Discs attract plenty of visual contact mostly due to their user-value; they hold an important function and whether it is by the user, ticket-checkers or passer-by, you will be guaranteed to get a fair share of customer leads. As will our range of branded keyrings, pens, clocks, mugs, umbrellas, eco-friendly bags, usb-sticks, folders, holders and other promotional vehicle accessories for more options! A promotional product that not only conveniences the driver but assures peace of mind allows for an association of these towards your very brand and company. To make use of such necessary promotional products and find the image of your brand grow not just in numbers but also in positivity! Car dealerships or registration offices are the ideal platform for your promotional clock discs as after any successful purchase made, these may very well be placed in the glove compartment soon thereafter and will most certainly find technical use. Insurance offices and driving schools are also a good place for such giveaways and bring a source of comfort to parking by leaving nothing to chance. Due to their small size, why not add such an original giveaway at any event or exhibition booth and stand out unlike your competitors? A feat further optimised by the personalisation of the promotional product as well as your use of colour contrast. Do browse through our branded keyrings, pens, pencils, clocks, mugs, umbrellas, eco-friendly bags, usb-sticks, folders, lanyards, holders and logo printed ice scrapers for more options!